The Chinese minister said that Israeli innovation could serve as a bridge between China and the U.S. The Chinese Minister of Science and Technology, Wang Zhigang, has landed in Israel Sunday for a two-day visit, according to an announcement by Israeli Ministry of Economy. 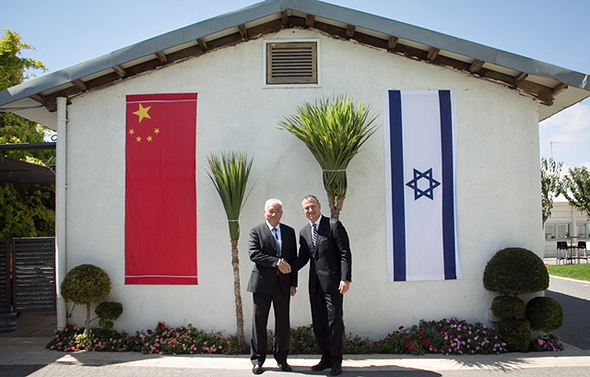 The visit is Wang’s first in Israel. Last week, Calcalist reported that Chinese vice president Wang Qishan has been appointed as the Chinese head of the China-Israel Joint Committee on Innovation Cooperation, and will visit Israel for the annual committee meeting at the end of the year. The Israeli co-chair is Israeli Prime Minister and Minister of Foreign Affairs Benjamin Netanyahu. A spokeswoman for the foreign affairs ministry told Calcalist that Wang Zhigang is in preparation for the vice president's upcoming visit. Wang met on Sunday with Israel’s Minister of Economy Eli Cohen and with Erel Margalit, a former Israeli politician and the founder of venture capital firm Jerusalem Venture Partners (JVP). During his visit to JVP, Wang said that due to Chinese President Xi Jinping’s focus on technological advancement, the country’s science ministry has become more international and is looking for collaborations, including with Israeli technology and companies. In 2015, the Chinese government launched Made in China 2025, a strategic plan aiming to turn China into a major manufacturing power that could rival the U.S. In July 2017, China’s state council released its new generation artificial intelligence development plan, intended to make China the leading global powerhouse in AI by 2030. In July 2018, two state-backed Chinese companies, China Merchants Group and peer SPF Group, announced a partnership with London-based investment firm Centricus to launch a $15 billion fund that will invest in or acquire tech companies in both China and globally.